Imagine a world without doctors, a brutal world that could exist in our near future or in the distant. For a second however envision a person you love with a life threatening injury. Are you prepared to deal with that? Are you prepared to save someone you love? No medicine and no doctors what are your options? There are a lot of great books out there about survival medicine or apocalyptic first aid. I have read some. Have you ever read one that featured so much preventative medicine? I have a gem for you on this episode of I AM Liberty. We are lucky enough to have a phenomenal guest. 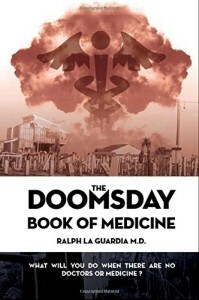 On this show we are talking to author Ralph La Guardia M.D on the show to discuss his new release The DoomsdayBook of Medicine. His book is addresses the scenario of dealing with illness and injury in the event that there are no doctors. What are you capable of? This book goes into great depth about how to become a one man healing machine. The book doesn’t only cover first aid but it expounds on great topics like vitamins and your nutrition. There is another great chapter on fermentation and fermented foods. I was thrilled when I got my hands on this book and found it not to be that run of the mill Army training manual about how to put on a tourniquet. It’s chock full preventative medicine, which is crucial in today’s world. We are going to have a great guest that will be open to questioning. I am sure if you call in with a question he will have no problem sending a copy of this great book. Don’t miss this episode of I AM liberty where we have a solid guest like Ralph La Guardia and his book The Doomsday Book of Medicine. Listen to this broadcast or download “Doomsday Medicine” in player below! Previous: Previous post: What is your TEOTWAWKI? Next: Next post: The Ultimate Survival Kit!